Anafi has a some great sandy beaches. The most popular are the one at the south part of the island, as they have nice golden sand and they are protected from the wind. To reach most of the beaches you will have to walk from some point on, as very few have easy access. By the way, there is no organized beach on Anafi. 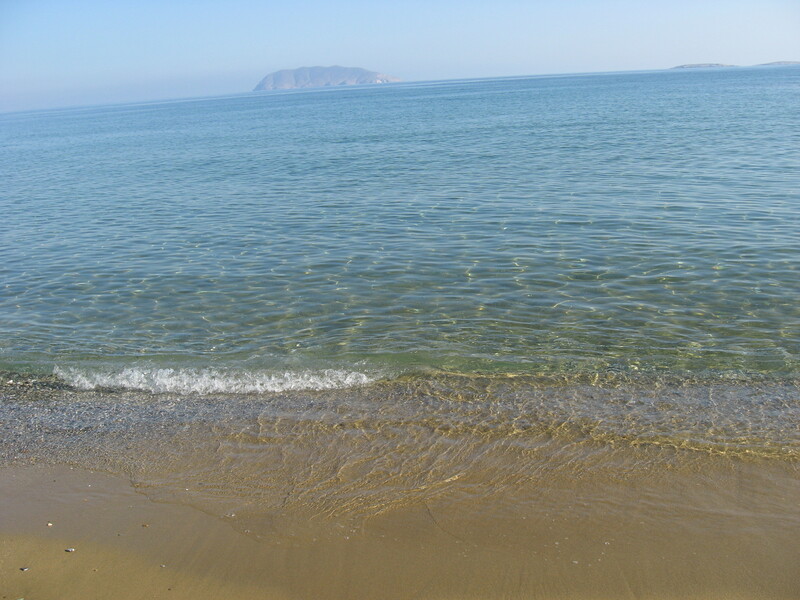 Agios Nikolaos: This is the beach of the port and the only one with easy access without the need to walk. Despite the port being there, the beach has very clean waters and great golden sand. Kleidisi: This is a long and wide beach with golden sand and clear water. It has easy access as it is in walking distance from Agios Nikolaos beach. Katsouni: This is a beautiful beach with nice thin sand but you will have to walk for about 15 minutes to reach it. There you will also see rocks with beautiful colors. It is possible to see nudists here. 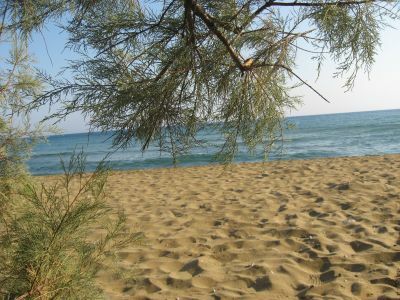 Flamourou: You can reach this small sandy beach by a path that starts from Kleisidi. It is next to Katsouni beach. 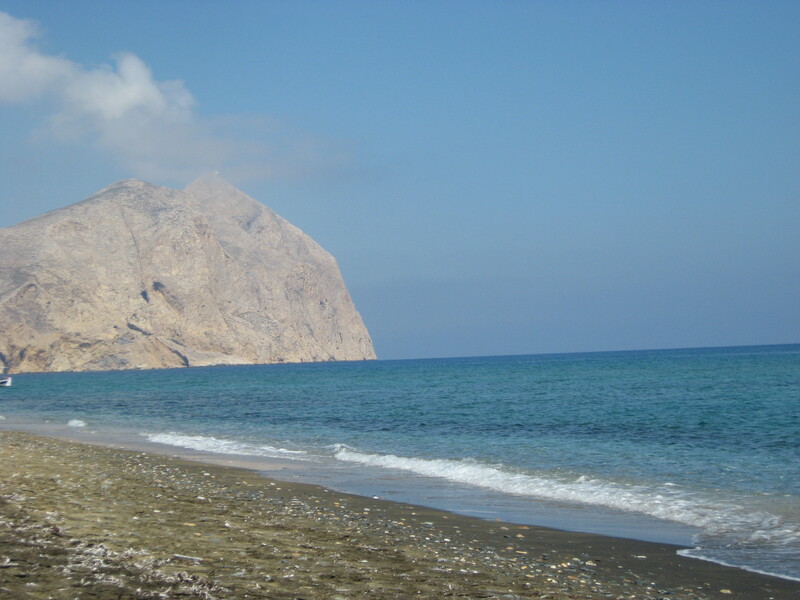 Roukounas: This is the longest beach of Anafi and also very wide. Roukounas is one of the most popular beaches as has nice thick golden sand with thin pebbles and some trees for those who do not gave umbrellas. It is possible to see nudists and campers here. There is also the Small Roukounas beach near by, with nice white thick sand, where nudism is forbidden. 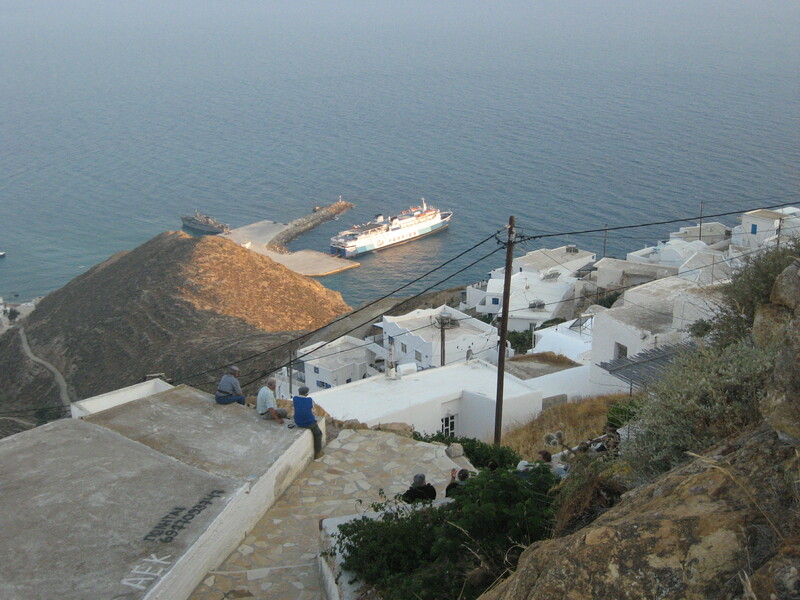 Katalimatsa: A very small beach where the ancient harbor used to be. The beach is surrounded by red rocks creating a distinct atmosphere. Megas Potamos: This is not a popular beach, due to the fact that you need to walk to reach it, so it is ideal for those who like to relax alone. 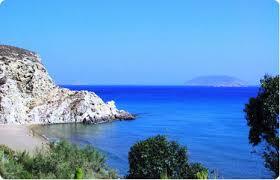 It is a sandy beach with a few white pebbles and a great view of Kalamos rock. Agioi Anargyroi: A beautiful small sandy beach that is surrounded by high rocks. 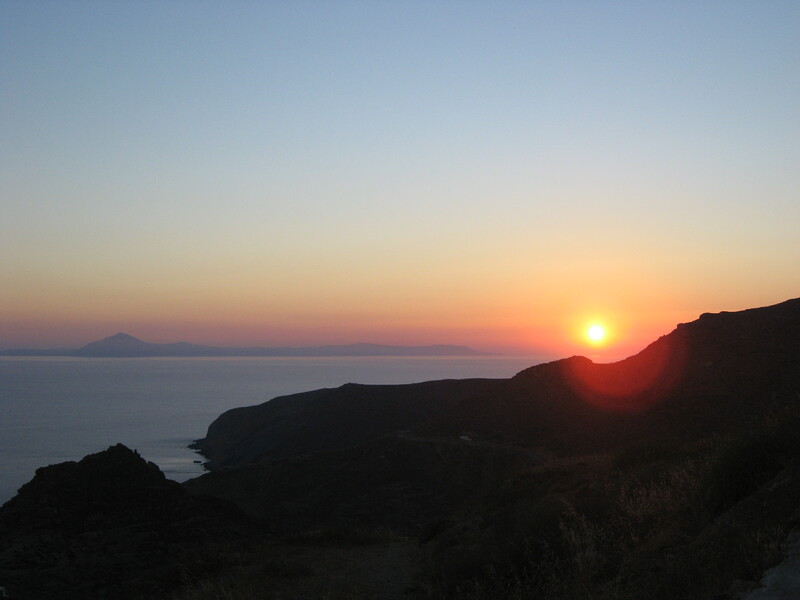 It is named after the small church of Agioi Anargyroi which oversees the beach. The path that leads here from the road is short and smooth. According to a local legend, anyone who swims in these water will soon get married. Monastiri / Prasies: This is a large beach with thick golden sand and thin pebbles right under Kalamos rock. The bay is called Prasies and the beach is names Monastiri after the monastery that is standing over it. You may find some campers here. Agios Georgios: There is a back road leading to this beach. Agios Georgios beach has crystal clear green water and rocks, both on the shore and in the sea. It is usually empty, except from August. Vagia & Kyparisi: Large beaches with big pebbles and rocks in the water in a desolate place surrounded by cliffs. 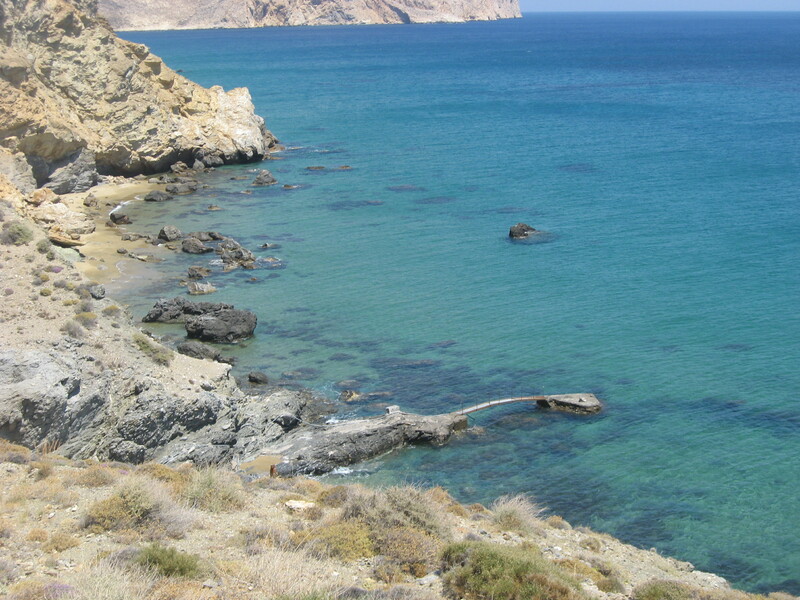 Not an attractive option for most, as all the beaches of west Anafi, but here you can get some privacy. 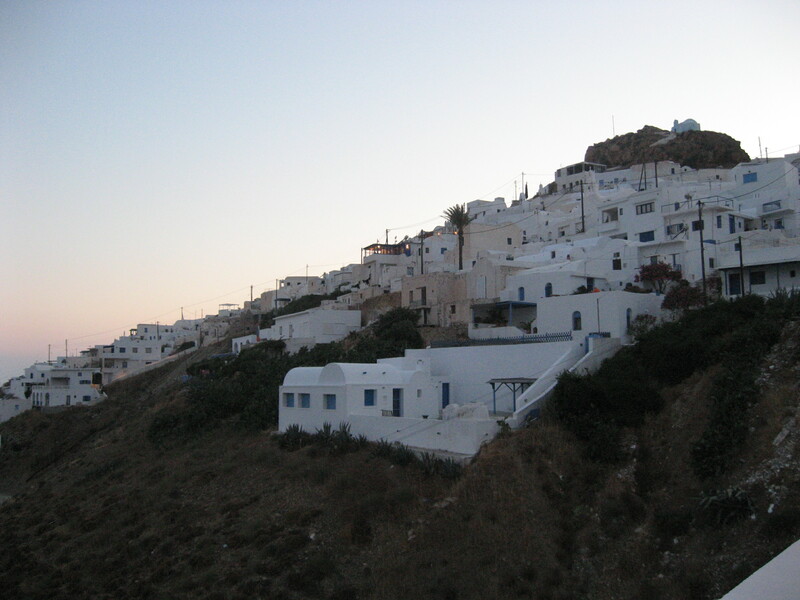 Chora is the only settlement on Anafi and it is definitely the main attraction of the island due to its beauty. At the north side of Kalamos rock, where it is very difficult to reach even from the sea, lies the Drakontospito (house of the dragons). Scientist have not found anything of great interest here, but the impressive 15 meter entrance, the beautiful golden-green coloring of its walls, the stalactites and stalagmites and its dark and deep interior make it a must stop for every visitor. According to local legends if you go all the way in the cave you will end up at an exit at the other side of Kalamos. 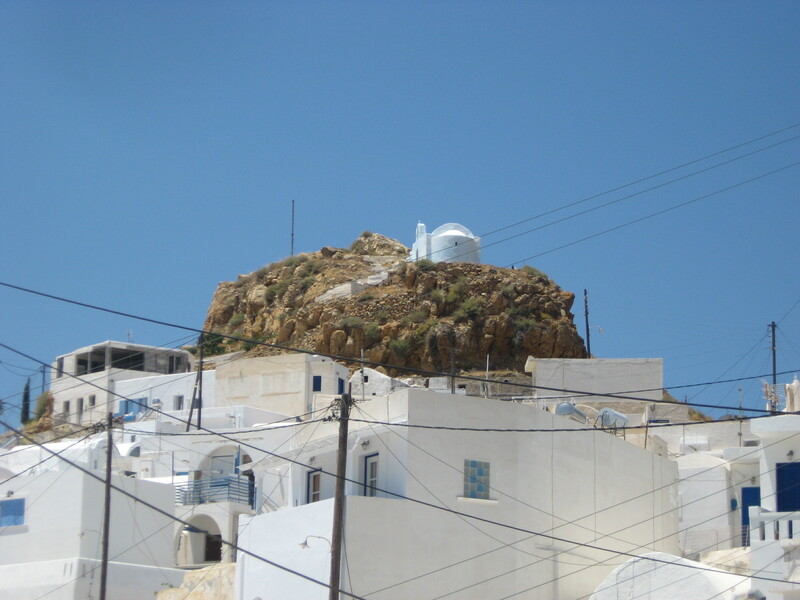 At the highest point and at the center of Chora used to lie the Venetian Castle. Its ruins are hardly visible, so the only reason to go there is the fantastic panoramic view. Although there is no Archaeological museum on Anafi, there is an archaeological collection in a small room in Chora (next to the community building). There, apart from the usual exhibits like sculptures, you will get to see some very interesting pictures of the transfer by locals and archaeologists of the relics found at the area of Kasteli. The collection is open only during Wednesday and Friday from 10:00 to 14:00. This monastery was built during the 17th century on the ruins of the ancient temple of god Apollo, at the point where the Kalamos peninsula is connected to the rest of Anafi island. During September 7-8th great festivities take place here and some people choose to stay the night of September 7th here and return to Chora in the morning of 8th for the celebrations. It is built on Kalamos rock and staying there overnight is considered a one-in-a-lifetime experience, as you will also get to see an amazing sun-rise. The temple is small but its exterior design and interior decoration show great interest. Here you will find engraved a Roman sarcophagus made of marble. The monolith of Kalamos is the second largest in the Mediterranean, after that of Gibraltar, and it makes for a stunning and imposing sight that you can not help but stare. It is an ideal place for hikers and climbers you sometimes choose to stay there overnight.